Mortech’s secondary marketing services are designed to automate and streamline your secondary desk, increase the efficiency of your day-to-day operations, and expedite internal communication. 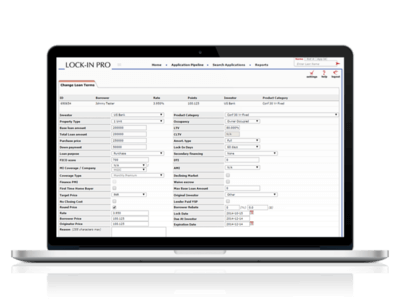 Improve visibility and management reporting efforts with a centralized lock pipeline. Compare multiple loan scenarios during the history of a locked loan, and save time and resources on loan re-evaluation with Mortech’s Historical Pricing. Increase your accuracy for re-pricing by viewing detailed historical information about the original, and current loan scenario side by side on one screen. The enhanced loan officer view within Marksman will include pertinent archived loan information. Seamlessly transfer your pending and locked loan scenario data directly from Mortech's pricing engine to third-party mortgage hedging partners. Unify your secondary desk and loan officer teams with internal communication tools to make sure both teams are aware of any updates to the borrower’s lock status. Present vital business metrics by creating custom reports based on criteria that you choose. Eliminate double entry and streamline your workflow by passing essential loan information automatically to your LOS.